If you are looking for an authentic taste of Italy on the Upper East Side of Manhattan, Sirio Ristorante at The Pierre (a Taj Hotel) is the perfect spot for dining. The setting is elegant, the style relaxed rather than stuffy, and the textures and tastes delectable. Although the hotel and restaurant share the same fabled Fifth Avenue address across from Central Park, this is no ordinary hotel restaurant. After sipping a glass of Prosecco and hearing the very professional waiter recite the dinner specials with an Italian accent, you begin to feel as if you’re ensconced at a cozy table at a trattoria in Florence or Rome. Designed by Adam D. Tiahny, the room evokes the feel of “La Dolce Vita” in the 1960s. The pleasant buzz in the room fades into the background because the tables are so nicely spaced. The restaurant, which opened about a year ago, is another prodigy of the same Maccioni family that created the celebrated, Le Cirque in New York in 1974 and now has six other restaurants around the world in addition to Sirio. Coincidentally, during the same week as our visit, Esquire Magazine honored the family as part of its Best Restaurants of the Year issue. Sirio’s new chef, Massimo Bebber was born and rained in Roncegno, a town in the province of Trento, Italy. We had been to Sirio once before and again, it lived up to our expectations. 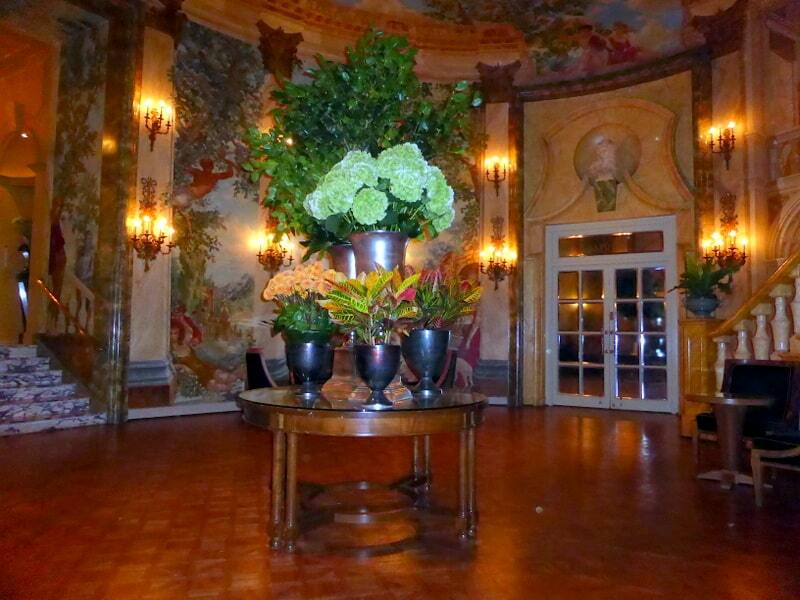 You can enter the restaurant from the entrance under the awning on the corner of Fifth Avenue at 61st Street but we wanted to go through the lovely Rotunda entrance with its decorative spiral staircase and beautifully painted floral walls that is accessed inside The Pierre. We started with a tomato-based amuse bouche that woke up our taste buds. Then for primi, my friend and I both ordered beef carpaccio with arugula, parmesan cheese, and black truffles that was drizzled with olive oil. My husband had the porcini mushroom soup with parmesan foam that was also delicious. Each dish was beautifully presented with a contemporary flare. We hadn’t realized it when we booked our reservations but found out that evening that the restaurant had fresh white truffles (flown in from Alba) on the menu. The truffle season is short and finding fresh truffles in New York is always a cause for celebration. We were there with a friend, and each of us couldn’t resist the call of the truffle dishes. My husband and I had them shaved over homemade tagliatelle and our guest ordered truffles with risotto. The aroma and tastes of each of the dishes was nothing short of orgasmic. For dessert, we shared three plates: cheesecake, tiramisu, and gelato. The only mistake we made was the sticker shock when we received the bill. We hadn’t checked the “market price” of the white truffles before ordering. The tab was just about the cost of a non-stop ticket to Italy but the outstanding meal made us feel like we had been there—and what a nice way to entertain a friend or celebrate a special occasion. Periodically, there are fixed-course menus that are a great buy considering the quality of the experience. On Thanksgiving 2013, for example, you can have a three-course fixed price dinner for $95 per person. Sometimes you can find Groupon coupons available for up to 25 percent off the cost of food and drinks at times when tables might otherwise go unoccupied. If you savor authenticity, white truffles at Sirio Ristorante are the real thing. Reservations are available on Open Table. This post is part of a linkup to Marcia Maynes’ Inside Journeys. Thanks for sharing, Irene! Added to my NYC list. That mural on the wall is quite a piece of art! Wouldn’t it make a great background for a wedding photograph? What a dining pleasure! I know that I wouldn’t pass up the truffles! Oh, no The waiter didn’t inform you of the price of the truffles?? That’s just not fair. On the other hand, wow. The photos are beautiful and this is a very special place! Looks wonderful! I had so many wonderful dishes made with porcini and truffles in Emilia-Romagna — what a treat. Would love to check out Sirio next time in NYC. I’d recognize that grand entrance to The Pierre anywhere. It really is eye catching. Judging by the food you have here, Irene, it looks like Sirio is a fantastic addition. Isn’t it great to splurge on a treat once in a while?